Ards' Kyle Cherry'celebrates after scoring to make it 2-2' against Ballymena. 'Photo by TONY HENDRON/Presseye.com. Colin Nixon claimed his first win as Ards manager, as the Red & Blues produced a barnstorming second half display at the Bangor Fuels Arena. 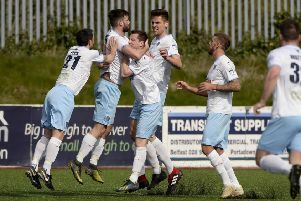 Nixon’s men were 2-1 down to David Jeffrey’s Ballymena United at half-time, but goals from Kyle Cherry, Carl McComb and Gary Liggett handed Ards a memorable 4-2 win. Ards handed United the lead in bizarre circumstances, in the 9th minute. The Red and Blues failed to clear the ball, with Johnny Taylor and Greg Hall trying to play the ball out from the back. United’s high pressing game allowed them to intercept the ball on the edge of the area, with Willie Faulkner drilling a low shot against the inside of the post. The ball rebounded back into the hands of Ards goalkeeper Hogg, but somehow, the ball squirmed out of his path and trickled over the line. The goal was greeted by howls of derision from the traveling support. Ards equalised in the 26th minute, when right-winger Craig McMillen cut inside and delivered a superb in-swinging cross that was nodded home by Carl McComb in emphatic style. United regained the lead two minutes before the break. The impressive Johnny McMurray collected the ball before drilling a low effort towards goals. McMurray’s effort beat Hogg at the near post. Ards equalised 27 seconds into the new half, thanks to a fine finish from Kyle Cherry. Michael Ruddy worked hard down the left flank, cutting the ball into the path of Carl McComb. The striker flicked the ball to Cherry and the midfielder kept his cool to slot his shot past Glendinning. French striker Guillaume Keke had the chance to give Ards the lead in the 50th minute, when through on goal, but he drilled his effort against the side netting. With the match finely balanced, Ballymena fans thought they should have been awarded a spot-kick when Allan Jenkins went to ground inside the area, but referee Evan Boyce waved played on. Ards had two chances to take the lead before making the breakthrough. A Gareth Tommons header went just past the in the 71st minute, before Gary Liggett befoe forced Glendinning into a close range save two minutes later. At the other end, Ballymena hit the bar when a looping deflected effort flummoxed Hogg. The Red & Blues scored the key goal 11 minutes from time when Craig McMillen picked out Emmet Friars at the back post. The Ards captained powered his header past Glendinning, who should have done better. Ards should have scored again when Carl McComb struck the post in the 82nd minute. The rebound fell into the path of Liggett, who somehow screwed the ball wide from close range. Liggett made up for his error in the 84th minute. The substitute latched onto a long ball forward before running through on goal smashing the ball home just inside the area. The goal less than 30 seconds after Kyle Cherry made an incredible goal saving tackle inside the Ballymena penalty box. Ards’ storming second half display meant they were well worth their first on pitch win in the league since October 1.